Seascape is a mixed-use development with commercial, retail and residential in the main building. The podium provides both public amenity in the retail and laneways, and private amenity for the residents in the pool, fitness room and rooftop terrace. 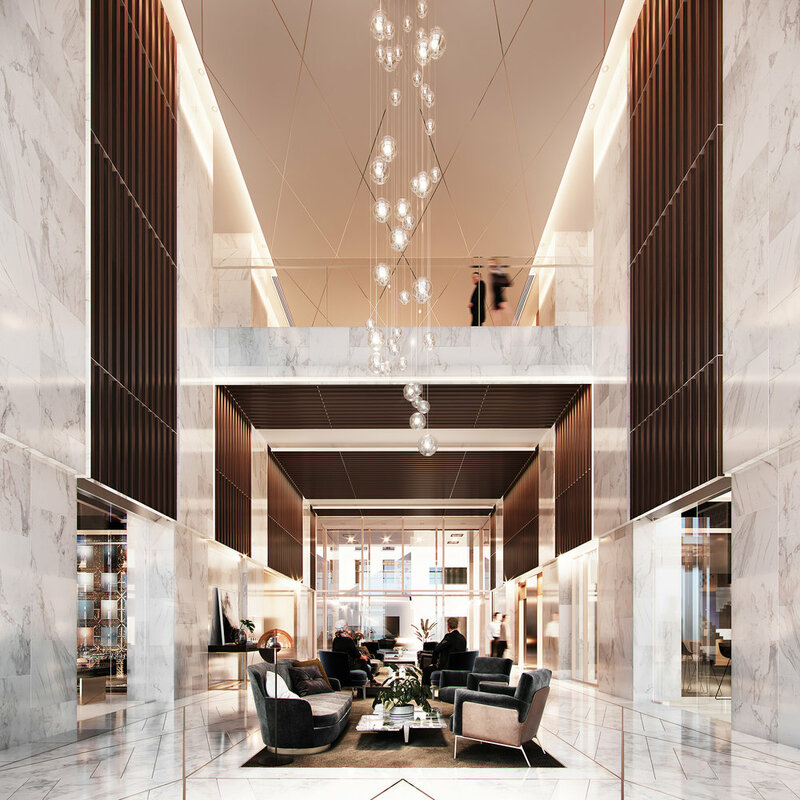 The Grand Lobby at Seascape is an impressive entry that runs the full depth of the building from Customs Street East to Gore Street Lane. The front of the space is a double-height zone adorned with a modern chandelier. The lifts are set back under the mezzanine and there are large retail tenancies on both sides. There is a three-storey glass atrium separating the main building and the new boutique hotel. Running the full width of the site from Customs Street East to Gore Street Lane, this exciting shared space is designed to activate the local streetscape and link into the lanes of Britomart and Fort Street. 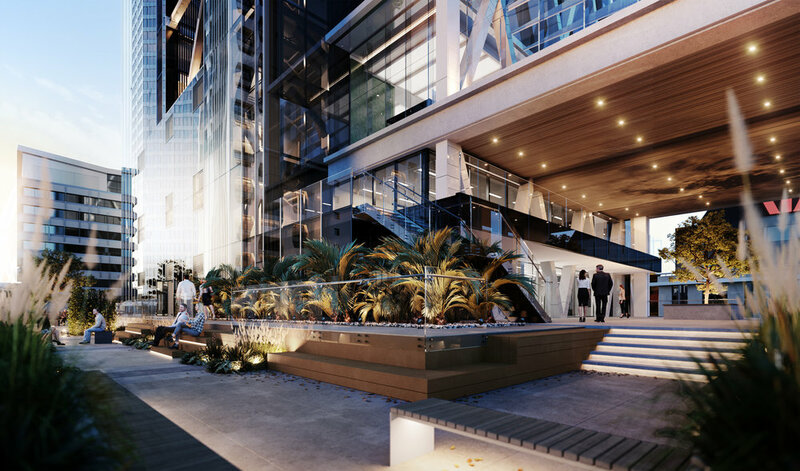 The Seascape podium has retail and office tenancies on Levels G, 1, 5, 6 & 7. It is intended that a high-end restaurant will take up at least one of these spaces. The offices have large open floor plates due to the innovative mega-frame structure, and open out to the podium terrace. Two car lifts exclusively service the VIP car parking on levels 2 and 3. These lifts are accessed from Gore Street Lane like the ramp to the basement parking. The pool, fitness room and changing rooms are located on Level 7 at the top of the podium. With a predominantly glass curtain wall façade, this level creates a visual break between the podium and the tower. The sculptural form of the tower’s mega structures continues in the pool area. The rows of inclined columns clad with carefully selected stone finish create a dramatic setting for training and recreation. In the spirit of Melbourne and New York, Seascape features an elevated outdoor terrace on Level 5. Located on the south side of the building and overlooking neighbouring buildings, this is an urban space that will come alive in the evenings.